One hot summer day Luke and his friends decide to play their favorite game of war, using sticks for guns and pine cones for bombs and grenades. When a new child in the neighborhood hesitates to join in and then tells them he has been in a real war in the country where he used to live, the other children start to see their game in a new light. A teacher from Vermont sent us a note and recommended we look at Playing War. We're incredibly pleased to be able to offer this book to our customers. Having spent time in Afghanistan in June 2002, we know first-hand what it is like to be a child in the midst of war. Playing War is a picture book that is read in a few quick minutes, yet has the power to draw children into reflection and thought and promote many important classroom discussions. Children today are besieged by violent images, whether it's from coverage of the Iraq war on the evening news, hunting and shooting the enemy on a video game, or on cartoons and programs available on television. Many children see so much violence—presented as entertainment—that they become desensitized to it and never see the game or the cartoon in human terms. When someone gets shot on a video game, it's "Pow! "—they're gone. They don't see an actual human, whose death will leave a family devastated. The children in Playing War step into someone else's shoes when Sameer, a new neighbor, tells them of his experience with war. Luke, the initial war-game-promoter, then sees war in a different light and realizes that war is not a game. 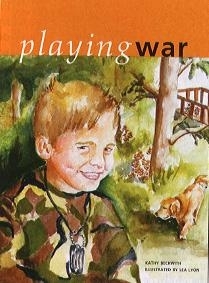 Playing War is a timely tool for educating children in building empathy for others and promoting respectful and peaceful environments. Educating children is an important step in changing our world. As author Harold Kushner said: "The small choices and decisions we make a hundred times a day add up to determining the kind of world we live in." Young readers of Playing War will discover the power each of us has to make a difference through acts of understanding and friendship. Heads Up! Playing War is a picture book that is read in a few quick minutes, yet has the power to draw children into reflection and thought and promote many important classroom discussions. One of the strengths of this story is the author Kathy Beckwith's choice to depict the children as thoughtful decision-makers. While some educators may choose to stick closely to the themes of alternatives to violence in children's games, others may embark on discussions in which children explore their potential roles as bridge-builders of understanding and as mediators in conflicts. Still others will plunge in and discuss what Wheelock college Professor Diane Levin refers to as "the real human impact of war." Playing War Book Club Meeting Guidelines: First, have someone read the book aloud. Then give everyone a chance to answer this Circle Question: Luke and his friends thought of several things they could do before they decided to play war. What is one thing you like to play or do either by yourself or with friends? What were some things that made playing war games fun or interesting for the kids? What about the way they divided into Soldiers and Enemies? Have you ever divided into teams that way? How do you usually choose teams? Why do you think Luke wore a dog tag? Why do you think Sameer had a top with him? Do you think Sameer really had to go home early that first day? What do you think he was feeling then? Luke said he wished they had a real war for kids. Why might he have said that? Sameer surprised his friends by saying there was a war for kids. What did he mean? What do you think Sameer did when he went home from school the day the shells hit his house? What might he have felt and thought? What made Luke erase the letter S and the letter E? What else would you like to say about the story? Things changed the second day when the kids knew more about Sameer. What can we do to make it easier to get to know someone else and the things that are important to them? Wars have always hurt people, including people who didn't plan to be in them. What can be done to help make wars not needed? Enjoy a toy of your own as you think about Sameer's life and his play. Why do this activity? Children will learn about the skills involved in playing with different types of toys. They'll have fun creating their own toy, at almost no cost—an idea they can share with others too. It gives them an "anchor" to Sameer's experience, and sparks curiosity about his play with a wooden top. They can also explore other toys and games that are popular in other cultures. You will need: A box of toothpicks (or at least 3 or 4 toothpicks for each person), a cereal box or other light cardboard or heavy paper, and a thumbtack. Cut a circle out of cardboard or heavy paper, about 2 inches in diameter. Add color or designs if you wish. Lay it on a cutting board or old magazine and poke a tiny hole in the middle with your tack. Carefully push the small end of the toothpick through the hole so it sticks out about an inch. Hold the top of the toothpick in your fingers and SPIN YOUR TOP! Then, experiment! Does a double-decker (two cardboard circles) work as well? Circles of various sizes? Two toothpicks instead of one? Just have fun, like Sameer did! Stories with violent images are commonplace in the media, with the result that many children or adults don't notice it! Are peaceful images as frequent? Why do this activity? Discussing violence in the media helps kids better understand how violence is presented to the public and how this affects their concept of the problem. Ask students to bring in magazines and newspapers and have each student cut out the images, words, advertisements, and titles that they perceive to be violent along with images they identify as peaceful. 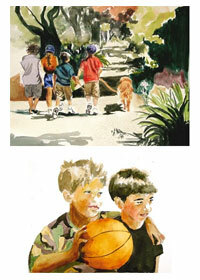 Have the kids create collages combining both the peaceful images and the violent images they have collected. Encourage questions, thoughts, and feelings about violence in the media. Ask questions like: How has violence in the media affected your views of violence? How is the violence on the news different from the violence you see on TV shows? Do news reports tell about friendly actions and positive problem-solving as often as they report on violence? Why or why not?